There are events… and there are EVENTS. One such EVENT is the 2013 PCA Escape to LA gathering being held this October. Not just any social gathering, this event plays like many national car club conventions. Four days of socializing and sight seeing among some of Southern California’s most scenic attractions. Hosted jointly by PCA Grand Prix and San Gabriel Valley regions, they expect between 400 and 600 people in attendance. An event that size takes lots of effort, commitment, and organization. So to that end it was our pleasure to showcase some of our favorite features built in to MotorsportReg.com and assist in setting up the event registration. The most important aspect of their registration process was the ability to know who was signed up for what, and on which day of the event. To make things interesting, each day contains specific events. Some events repeat, but not necessarily every day. Some events are only available on certain days. Also, there are some tours that can only handle a certain number of participants each day. To get the data the organizers needed, while maintaining a registration form that was relatively simple and intuitive, we decided on individual packages and associated assigners that would automatically assign participants into the correct "bucket" based solely on their choice of activity for each day. This meant lots of "parts" working behind the scenes. 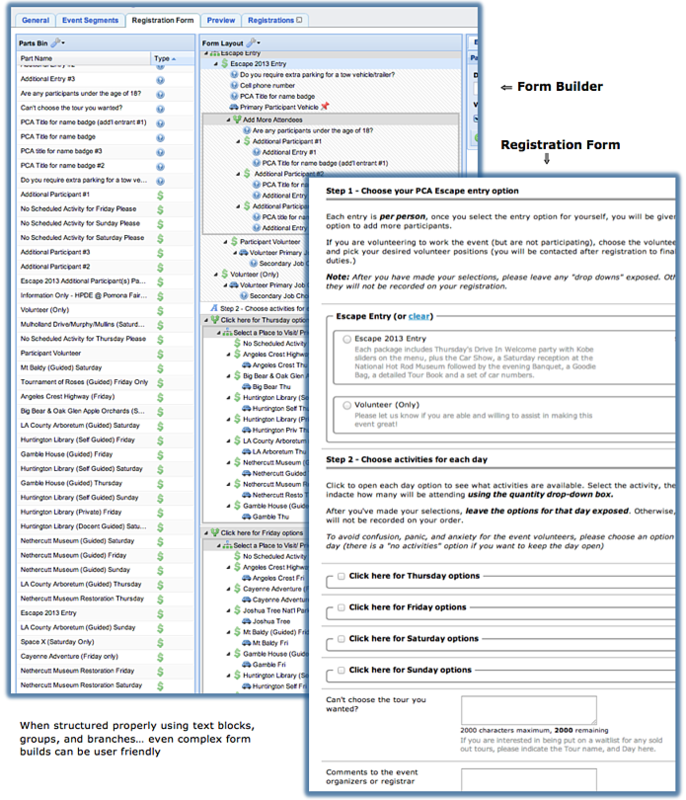 But the end result is a registration form that flows logically for the attendees (with the help of the new Text Block feature as section headers and in-form instructions). This provides clearly defined end data that can be manipulated in just about any way desired by the organizers who will be on the ground wrangling cats… I mean managing their participants! In the spirit of registration form simplicity, the only profile information being used is that from the primary entrant. The names of their guests are collected via event questions on the order form. Each tour has a quantity option (up to 4). Our multiple user account functionality can easily be used here to gather and use guest information in addition to the primary entrant, but for an event with so many options as-is, we thought it best to err on the side of ease for the attendee while still mainting detailed data for the organizers. The Saturday Tour report is a list of all attendees that chose a tour for Saturday, grouped by tour, sorted within each group by name. Detail information (like guests) is included in each row. 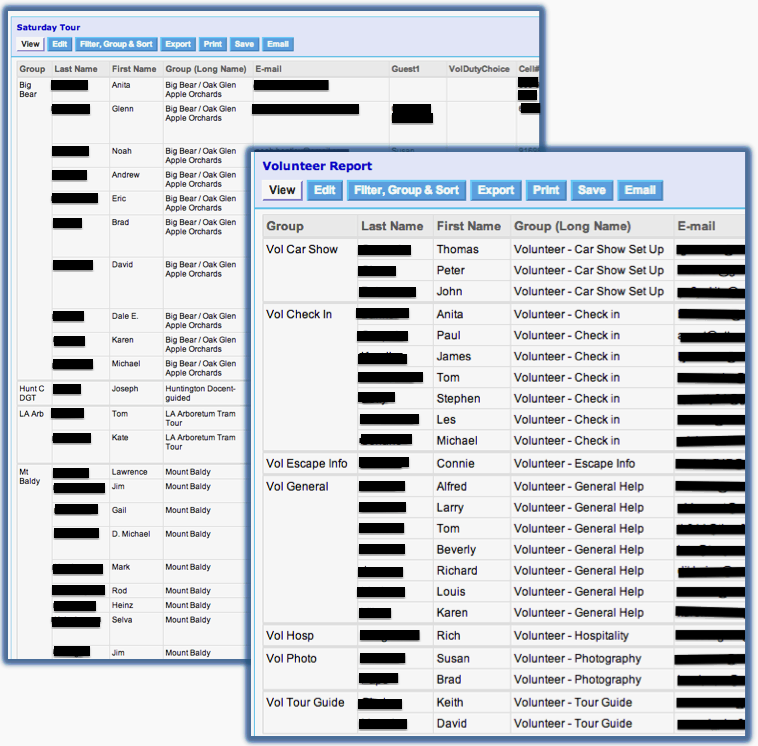 The Volunteer report is just that, a list of volunteers, grouped by the volunteer activity they chose with contact information contained in the rows. Because we used segments and groups to keep detailed data, our reports can be edited in many ways to get the results needed. For more detail on how to configure your own reports, click here. PCA Escape 2013 wouldn’t be complete without some gorgeous swag. 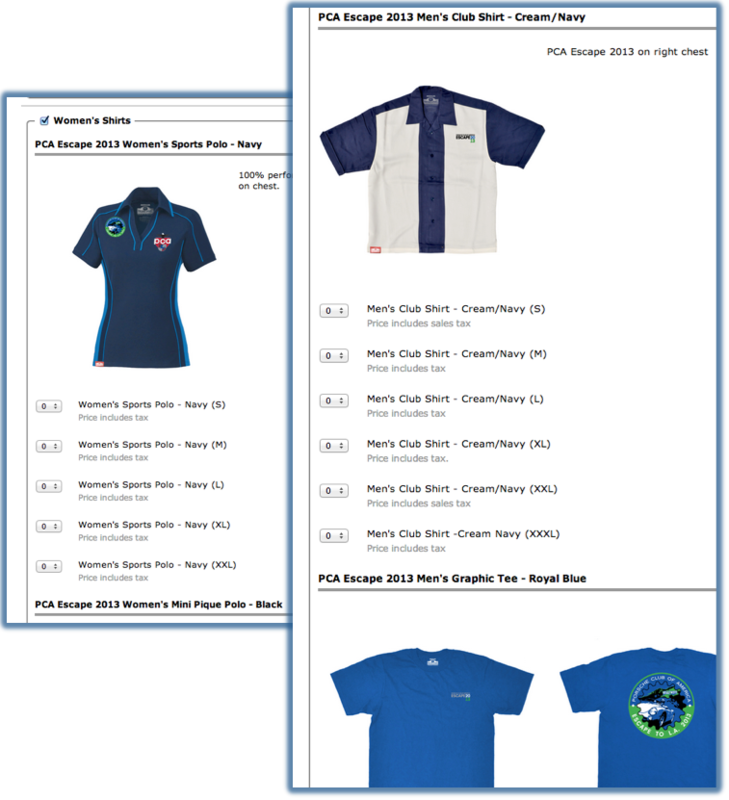 The clubs decided it would be best to create a separate event to sell the clothing, so we created a virtual Goodie Store on MotorsportReg.com. Again, we used the new Text Block feature to make the order form as user friendly as possible.